The NASA/ESA Hubble Space Telescope has found a space anomaly that very well proves the existence of God. Hundreds of scientists confirm God’s word is being transmitted from deep within outer space. Judy Schmidt is credited with first spotting galaxy cluster, knowns as SDSS J1038+4849, and submitted the image to Hubble’s ‘Hidden Treasures’ image processing competition. 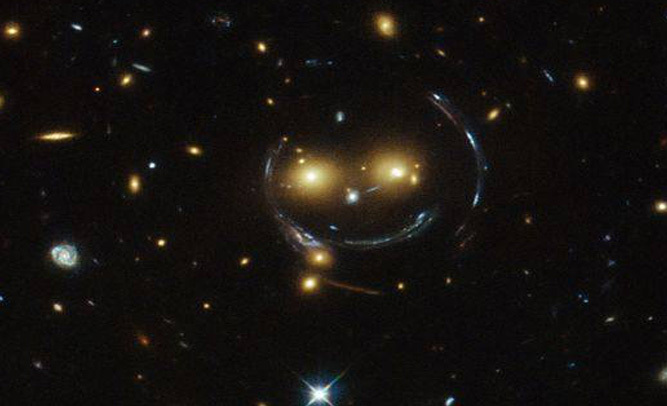 Because of its resemblance to a smiling face, the galaxy cluster has gotten worldwide attention.